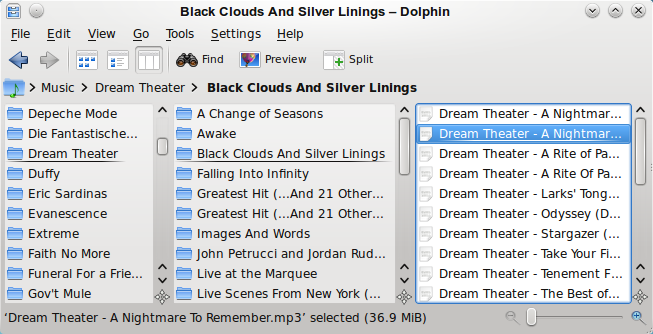 As usual after the KDE feature freeze, I'd like to give an overview which improvements have been done in Dolphin for the next KDE SC. The facets provide a very comfortable way for the user to shrink the number of search results. From a developers point of view those facets are a great thing too: It is easy to integrate them into an application. A lot of default facets are offered by Nepomuk, but it is also possible to embed custom facets. 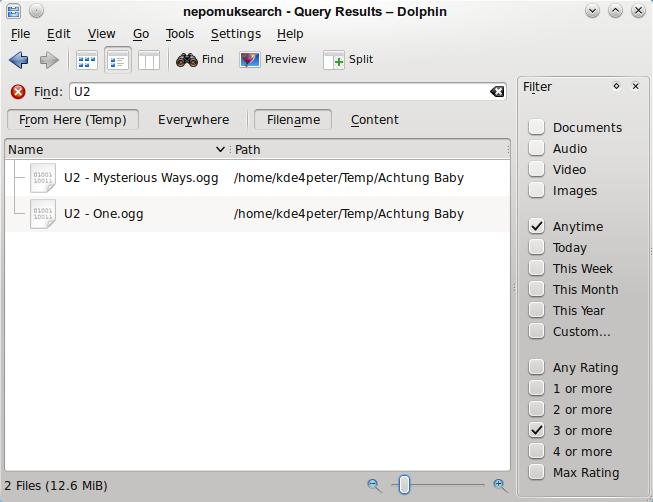 As mentioned earlier Dolphin now allows to search for files even if Nepomuk is disabled, however the "Filter Panel" is a feature that only works in combination with Nepomuk and indexed files (at least for KDE SC 4.6). The default view has been changed to show the path. The context menu allows to open the search result in a new tab or window. The column width can be changed by the user. 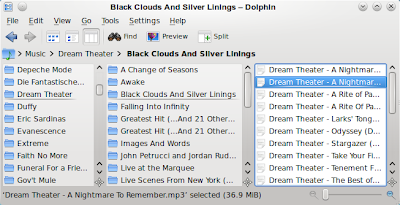 The column width automatically is extended to the longest filename. Rubberband selection like in the icons-view and details-view is possible. Neighbor columns are always aligned in a way that it is possible to navigate through all columns without using the horizontal scrollbar. Sebastian Dörner and Johannes Steffen have implemented a Git plugin for Dolphin. It is part of the kdesdk-package. Folders Panel: Improved automatic horizontal scrolling (can be disabled now too). Dolphin and Konqueror offer so called "services-menus", which are shown when opening a context-menu of a file or directory. For example the context-menu for a JPG-file will show the menu entries "Convert to PNG", "Convert to GIF", ... - those entries are service-menus. It is very easy to create a service-menu. In a nutshell it is just a text-file that allows to start an application with the selected files as parameters. But service-menus also have some restrictions: Only the MIME-type is used as criteria to define which entries are shown. So it is not possible to show a service-menu only if e.g. exactly two files are selected or to create dynamic service-menus dependent on some meta-data of the selected files. Sebastian Trüg has written an interface called KFileItemActionPlugin that bypasses those restrictions. The interface will be available in KDE SC 4.6.0 and is supported by Dolphin and Konqueror. Some developers might notice the similarity to the KonqPopupMenuPlugin, that has been available since ages, but is not supported by Dolphin. The reason why it is not supported in Dolphin are some interface-issues when using the plugin outside the scope of the Konqueror context-menu. After discussing this with David Faure and Sebastian Trüg we decided to cleanup the interface, call it KFileItemActionPlugin and mark the KonqPopupMenuPlugin as deprecated. Sadly there are not much applications for KDE 4 that take usage of the KonqPopupMenuPlugin interface. On one hand this is good as this means less efforts to port it to the new KFileItemActionPlugin interface. But on the other hand for the users out there this means a not so tight interaction of the KDE file-managers with applications.